The kids are out of school today for winter break. They will be home for two weeks. I’m trying to get all my work done now before their best friends forever “I’m” and “Bored” start visiting them. Mawlid Al Nabi is a Muslim holiday commemorating the birth of the Prophet Mohammed (peace be upon him). 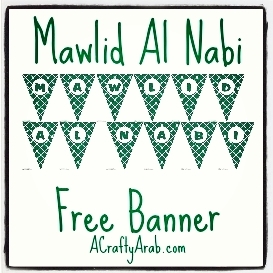 Using the simple banner design from my free printable Green Eid Decorations, I changed the letters to read Mawlid Al Nabi. I thought of changing the colors too, but with a limited amount of time before the kids and their BFFs take over, my To Do list is long but my day is short. If you have a favorite color, let me know and when my life returns to normal in January I can try to do a different look. No promises. I have paper cuttings I might still be cleaning up. Enjoy the download and may you have a blessed Mawlid.